James Brown has never really been portrayed as a sympathetic man, but for a short period in the late 60s he was suddenly taken by a sense of duty to artists who had been fixtures at King Records when he was first signed there over a decade earlier. First up was his tribute album “Thinking About Little Willie John And A Few Nice Things”, which mixed originals with versions of songs John had first sung. Next he began working with Hank Ballard, who had been signed to King since 1953; the collaboration produced the LP “You Can’t Keep A Good Man Down”. He then produced a couple of sides with organist Bill Doggett, who’d reached #1 R&B/#2 Pop with his 1956 instrumental ‘Honky Tonk’. A hit of that size meant that Doggett was never short of gigs, and in its aftermath he reached the R&B Top 20 five more times. In 1960 he left King, signing to Warner Brothers, then with Columbia in 1962 and Sue Records in 1964. In the meantime, King kept up a steady release schedule of Doggett records and he re-signed with them in 1965, staying for two years. 1969 saw him back again at King for another couple of years. Doggett’s recordings from this period took two distinct paths: some were almost cheesy easy listening sides, while others suggested he was keeping up with modern trends. The most obvious manifestation of this was his collaboration with James Brown and his JBs, who were incredibly tight on the top-side of the super-rhythmic ‘Honky Tonk Popcorn’. The popcorn was Brown’s dance rhythm of the year: he had made #1 R&B with ‘Mother Popcorn’, #2 with ‘Let A Man Come In And Do The Popcorn’. 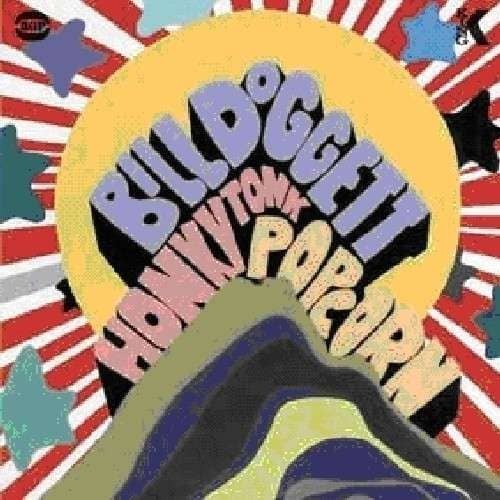 The B-side of the single was Doggett’s funk update of ‘Honky Tonk’, which worked even better than Brown’s own 1972 remake. King then gathered up a bunch of recent Doggett recordings to make the “Honky Tonk Popcorn” album. It was marketed as a James Brown production but, other than the two single sides, it contained no cuts produced by Brown. Instead it featured a fascinating mix of grooves that evoke smoky clubs and juke joints. ‘Mad’ and a scorching version of Edwin Starr’s ‘Twenty Five Miles’ were released as singles. For this reissue we’ve turned up five bonus tracks. Of these, ‘Before Lunch’, ‘Short Stack’ and ‘Some Kind Of Head’ were lined up for inclusion on an album to be called “Take Your Shot”, but we’re pretty sure this did not make it past the planning stage and was replaced by “Honky Tonk Popcorn”, with these three dropped to make room for the two James Brown-produced cuts and ‘Twenty Five Miles’. ‘Before Lunch’ sounds like the finest record Booker T & the MGs forgot to make, while ‘Short Stack’ ups the pace to frantic. Best of all is the brilliant ‘Some Kind Of Head’, which takes the feel of a Stax instrumental. The other bonus tracks, ‘Sassy B’ and ‘Wet And Satisfied’, offer a fascinating insight into the history of Funkadelic. In the time between recording Funkadelic’s first two albums guitarist Eddie Hazel and bass-player Billy Nelson left the group. Nelson joined Doggett’s band for a short time. Until now Eddie Hazel’s participation on a Doggett session was unknown. However, the songwriting credits and the guitar style suggest that he too was working alongside Nelson and Doggett. The ‘Honky Tonk Popcorn’ single and album did not return Doggett to the charts, but he remained active. He kept recording and toured until the year he died. He tended to revert to the style which made him famous: the 50s boogie shuffle that had been the basis of his defining hit. When he died on 13 November 1996 his short sojourn into funk was largely forgotten except by a few clubbers around the world who coveted this in-demand LP. Customer evaluation for "Honky Tonk Popcorn (1969)...plus"